Everyone has enjoyed the classic deviled egg, but have you ever had it as a dip? This easy and fresh spread is a great way to serve up the party app with far less work. There's no need to make sure you have perfectly-filled egg halves and no rummaging around for special egg platters. Just like the traditional deviled egg, this recipe has the same tang and zip, as well as a nice creaminess. You can also mix up this dip with all of the different variations below—make it spicy, add in bacon for brunch or chopped pickles for an extra bite. To make the perfect hard-boiled eggs, use this helpful tutorial. With a few easy tips and tricks, you'll have a batch of cooked eggs with no green or gray centers in sight. Cut the eggs in half after they have completely cooled. Check to make sure the yolks are pale yellow and fully cooked. If you follow the hard-boiled tutorial, you will have perfect eggs in 12 minutes. Green or gray yolks will adversely affect the color of the salad, so make sure to check. You can hard boil the eggs a day or two in advance if needed. Chop your hard boiled eggs into a small dice. Make the dice smaller if you are looking to turn it into a spread. Add the eggs, chives, Dijon mustard, mayonnaise, lemon juice, salt, pepper, and paprika to a large bowl. You can also whisk the other ingredients besides the hard-boiled eggs before folding them in. Gently combine the ingredients in the bowl until everything is evenly distributed. Do not overmix! 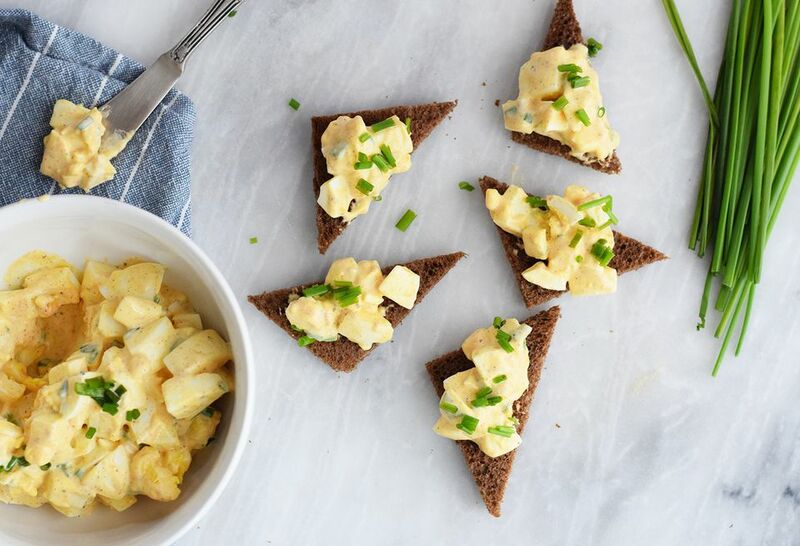 Cut the toasted bread into triangles and top with the deviled egg salad. Add a sprinkle of paprika and more chives if you wish. Chop the eggs smaller or blend it in a food processor and use it as a spread for bagels or crackers. Buffalo Style: Make it spicy and tangy by adding 1 teaspoon of Tabasco sauce and ranch seasoning. BLT Style: Add bacon, chopped tomato, and a 1/2 teaspoon of ranch seasoning for a salty and smoky kick. Dill Pickle Style: Add a little chopped dill pickle, plus chopped fresh dill. Chipotle Style: Dice up a chipotle peppers and throw it into the mix with a little bit of the adobo sauce. Jalapeno Style: Throw in a diced jalapeno for a little added heat.